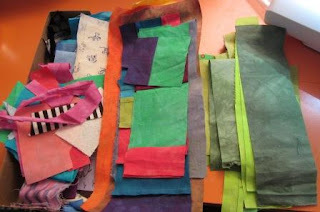 I have another block to add to my Rainbow Scrap Quilt, part of the Rainbow Scrap Challenge 2012. I love making these blocks. 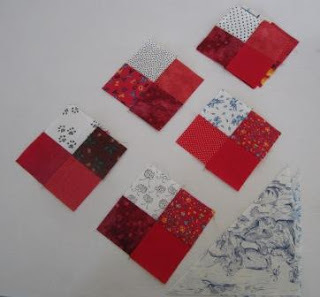 I now have two red ones so I think I will be making two of each colour in my quilt or maybe I will be making two quilts. I can always give one quilt away. If you want to make some with me here is what I am doing. I sorted my scraps into colour families. I start by make a 6 inch (6 and half inches unfinished) centre using my scraps. I make what every I think I have scraps for. Maybe triangles or the log cabin, or a pin wheel, if it is not big enough add a strip on a side or two. I try to look for some contrast within my 6 inch unit. Then I cut 1 and half inch Kona white strips and frame it with the white. Then back to the scrap box for my strips. I make a strip set with some of the strips. I try to get it 13wide by 11 inches long. The strips that are too short go at one end. Again I look at having some contrast here. I cut 2 and a half inch wide strips off the strip set. If some are short of 12 inches they go on the block first as it only needs to be 8 half long on two sides. Then add the 12 inch long pieces to the outside last. If you are short just add a little more of a scrap. The blocks finish to 12 inches (12 and a half unfinished size). I got a few red hearts done this week too. Today is Happy Scrappy Saturday over at Soscrappy and is part of the Rainbow Scrap Challenge 2012. Soscrappy has done the linky thing Here for the first week of the Rainbow Scrap Challenge. I also have the logo over on the right margin if you want to check it out and join in the fun. This month we are working on the colour Red. 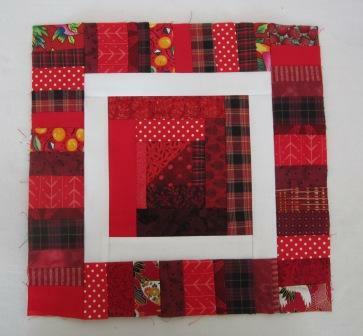 As I now have two red blocks for the rainbow quilt I needed to do something else. Years and years ago, I made a pink heart quilt by making the little four patch units and placing them on point. The quilt was given to charity. I am sure I took a photo but it would be a film camera, over 10 yrs ago. I will post if I can find it later. I dug in my box of red and used some of my bigger scraps to cut 2 and a half inch units. I had a stack of neutral squares ready to go. Some of the reds were 5 inch squares I got at CQA Quilt Canada St John`s Newfoundland in June 2008. They were in my goody bag. Memories of scraps are great. I found another box of scraps to sort out yesterday. Most of the scraps were of good sized hand dyes and most were green, again. My box of green scrap is really over flowing. I am not sure I want to make green hearts and will have to come up with more scrap ideas to make a dent in the green. I am heading out with the Dog to a Agility Fun Trial Day. Everyone else is home enjoying the last of the holidays, school work again Monday. I like your red scrap block...cool idea! I really like your block - you have some great ideas for blocks! I envy your green scrap stash....I had to go buy green yardage for my green scraps quilt. Come by my blog and see it in progress!